owner of VinyljunkiePR and writer for Ibiza Voice Magazine. Hand picked cuts from international labels, showcasing many un released tracks from around the world. Hailing from Los Angeles now living in Chico, David Van Sant is one of the most technically proficient djs we know. Keeping the groove locked with quality house music with a jackin flavor, DVS builds his set with a journey in mind. get ready to sweat. 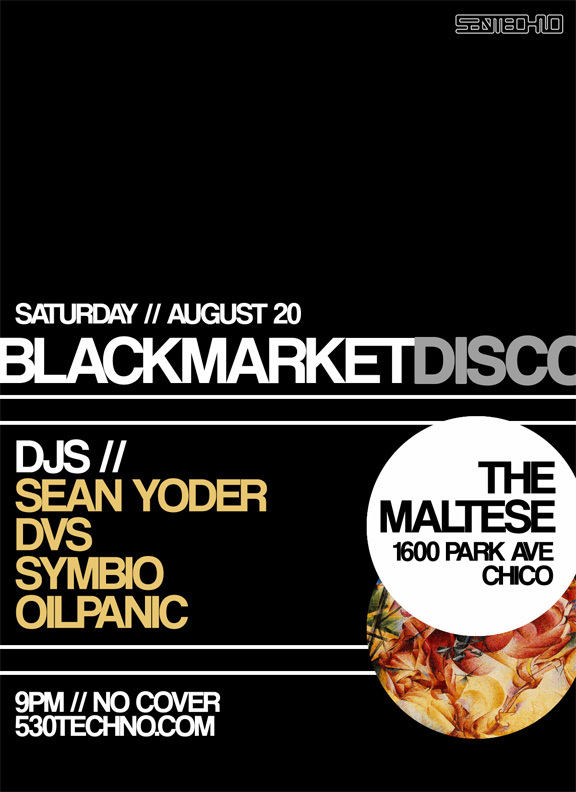 This entry was posted in Events and tagged abstract_Terrorist, Black market Disco, Chico, DVS, House, Oilpanic, sean-michael yoder, Symbio, tech-house, techno, The Maltese, underground music. Bookmark the permalink.